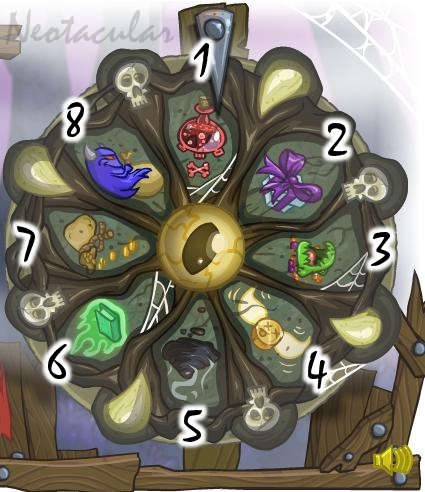 This wheel is located in the heart of TDeserted Fairground and it will cost you 150 NPs to spin the wheel. One of the great things about this wheel is that you can spin the wheel every 2 hours. 1 Your pet comes down with a disease. 2 A random gift (see below). 3 A random spooky petpet. 4 You lose some Neopoints (it is possible to lose all the Neopoints you have on hand!). 5 An item in your inventory is turned into a Pile of Sludge. 6 Your pet will "forget" a book, so you'll have to read it to them again in order for it to show up on your pet's "Books Read" list. 7 You win some Neopoints. 8 The Pant Devil steals an item from your inventory! When you land on the random gift space in the wheel you will recieve one of these prizes. Random when landing on any spot on theWheel of Misfortune. There is no message informing you that you have received the avatar, so check your Neoboard preferences.